Bangui, photo by Harold Davis. View this image larger. This image shows a Bangui butterfly from the Central African Republic. I captured it for reflectivity rather than transparency, and then cross-processed the resulting image. The fire power required to cross process is considerable. I’m running Photoshop CS2 on a Mac Pro with dual core Intel Xeon processers. In other words, four CPUs. The system runs at a top-of-the line 3GHz. I’m now up to 5 Gigabytes of DDR2 RAM, which is danged fast memory, and a heck of a lot of it. The memory modules have their own heat sinks and look like minature nuclear reactors. Even so, when I have a large-sized image open with multiple layers and masks, my system starts to crawl. Probably performance will improve once Adobe releases a version of their Creative Suite designed to run natively (rather than via a simulation layer) on the Intel Xeon processors. Don’t get me wrong. I love my system, particularly the 30″ monitor. The whole thing is beautifully engineered. And, I can see my photographs to edit them in a way I never could on my Windows system. When this happens, I often get a window on the screen asking whether I want to file a report on my problem with Apple. I hadn’t been bothering with this until I was told recently by “someone who should know” that Apple does actually follow-up on these problem reports. 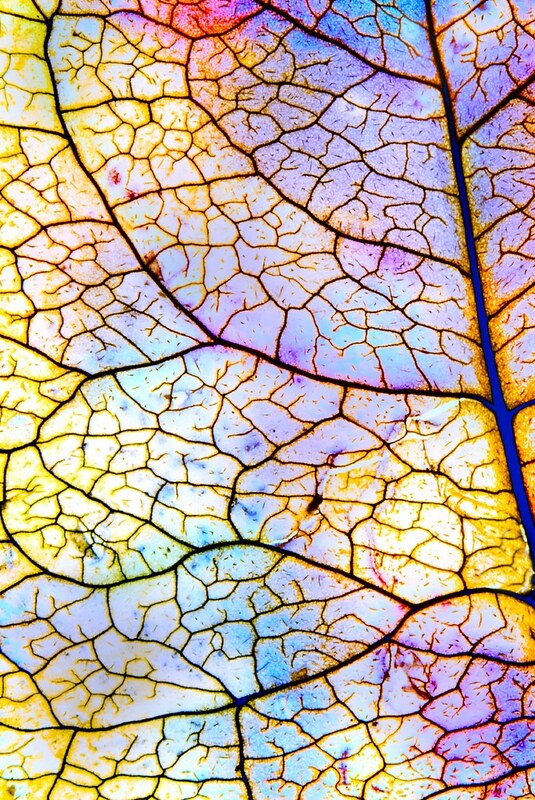 Capillarity III, photo by Harold Davis. View this image larger. In the days of film, cross processing meant developing film with the process meant for another kind of film, like shooting Ektachrome (normally processed with the E6 process), and processing it using the C41 process (meant for Kodacolor). Film cross processing sometimes generated striking and strange color phenomena, and other times struck out entirely. 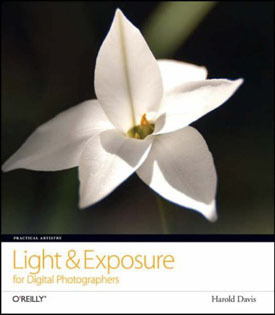 The closest digital analog to cross processing is to invert or equalize individual channels of an image in Photoshop. I post-processed this image using a number of different versions of these manipulated channels, and then reapplied the inversions to the inverted image. To make this all easier, I’ve written a Photoshop Action that creates multiple duplicates of an image, and then seven different cross-processed versions of the original image so that I can easily see which work best. Golden Gate Bridge from the Berkeley Pier, photo by Harold Davis. View this photograph larger. I took this photograph during a session on the Berkeley Pier at sunset in January of 2006. This was one of the very last captures I made before the sun went down, and I remember thinking how interesting the street lights looked against the swiftly darkening sky. When I reviewed the image on my computer I did not find it acceptable because the entire lower left quadrant had gone to black. In other words, there was far too much contrast between the light and dark areas in the photograph. Fortunately, my post-processing skills have caught up with the way I saw the scene, and how I wanted the photograph to come out. The image you see here is the result of five different exposures from the RAW file blended together using layer masks, each layer with a different opacity, and with Normal, Screen, and Color blending mode used depending on the layer. 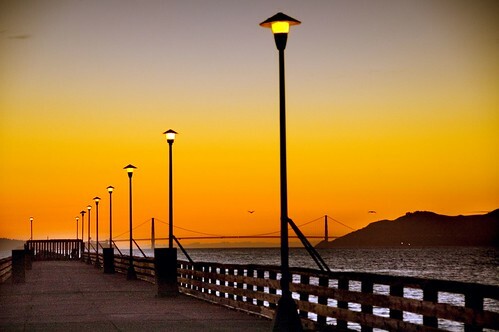 The five layers, each corresponding to an area in the image and each essentially representing a different exposure, are: general background (including the bridge and sky), water of the Bay including the Marin Hills, an intermediate layer for the pier fence, a layer corresponding to the darkest area of the pier, and a special layer for the street lamp lights. For my money, the only problem with the finished image is that the layer exposed for the darkest area of the pier has a little too much color noise for my taste. Still, overall it came out pretty well. My moral here is to hold that thought. With digital photography, if the concept behind an image is valid even if the execution is not, you should simply file the image away because there is always the chance that either the technology or your skill set will advance to a point where you can achieve the effect you wanted in the first place. Since I’ve saved a version of the image with the multiple layers and masks in Photoshop, maybe someday I’ll figure out how to reduce that pesky color noise in the lower left! Morning Fog over Oakland, photo by Harold Davis. View this photo larger. In the morning we drop Nicky and Mathew off at their pre-school high in the Berkeley Hills. Then we continue across Grizzly, driving along the crest of the coastal range. Yesterday morning was foggy and chill. After dropping the younger kids off, we drove south. Past the Oakland city border, we climbed out of the fog. 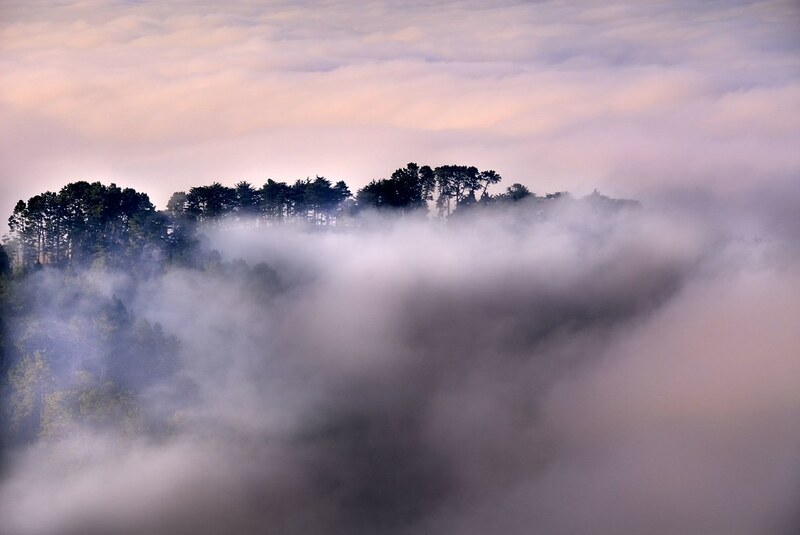 The sun was rising over the sea of fog, and I snapped this photo from an overlook. The rest of the world was covered with fog. If you had xray vision and were looking at the scene in this photo, you’d see the downtown Oakland skyline, San Francisco Bay, and the peninsula south of San Francisco. In fact, this is more or less the view on a clear day (the ridge with trees in the photo above is a little to the left of the scene shown in the link). But, of course, there’s no sign of the urban environment, or even any specific geographic markers, in this photo. I try to bring a camera with me on these morning runs for obvious reasons. As they say, if you don’t have the camera with you, you’ll never get the photo. Continuing on the school drop-off run, we dropped down past the old Claremont Hotel into the world of fog and found Julian’s school. Dropped in his tracks, photo by Harold Davis. 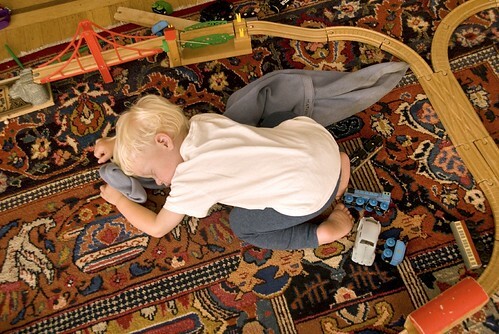 Mathew goes at full throttle until he passes out. He’s been known to fall asleep at the lunch table, his head silently slipping into his bowl of cereal. 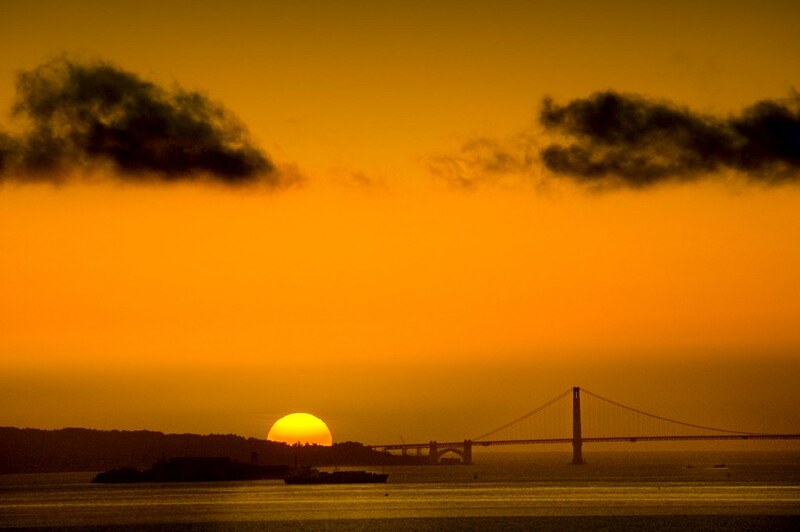 Sun and Bridge, photo by Harold Davis. View this photograph larger. A photograph of the sun setting to the south of the Golden Gate Bridge from last winter (there are only a couple of weeks in January in which this happens) taken from the water front near Cesar Chavez Park in Berkeley. Here are some of photos showing the sun setting right in the middle of the bridge. Alabama Hills 1, photo by Harold Davis. View this photograph larger. 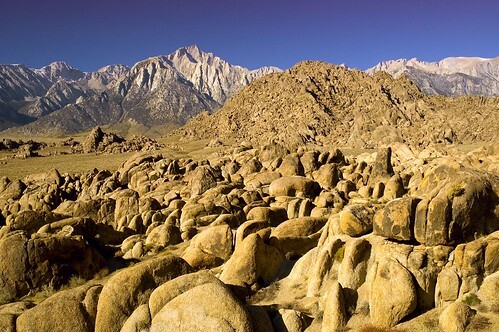 This is a photograph of the Alabama Hills in Owens Valley on the east of the Sierras with Mount Whitney in the background. I took the photograph on a trip to the Eastern Sierra and Death Valley in the autumn of 2005. I reprocessed this version of the photo to be more naturalistic than my original post-processing (shown on Flickr and as a thumbnail in Crossroads of the Cowboy Universe). Mighty Mite, photo by Harold Davis. View this photograph larger. 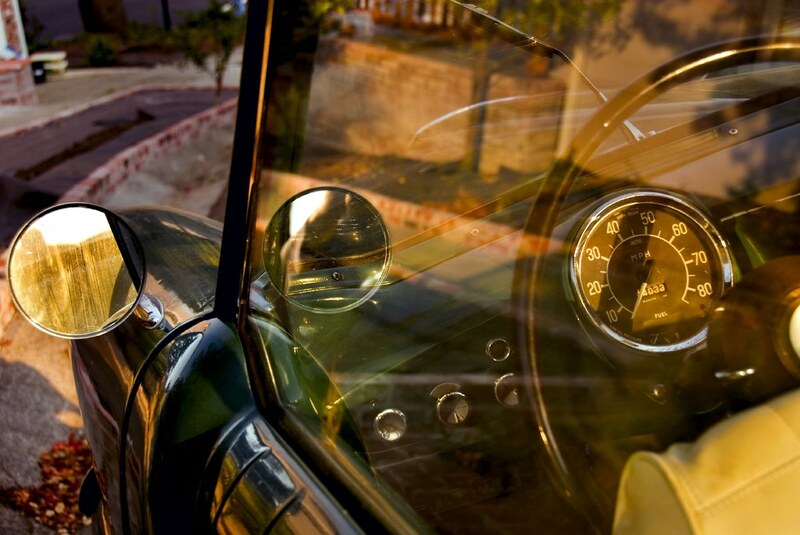 This is a photograph through the driver-side window of the speedometer and mirrors of a Nash Metropolitan. This wonderful but tiny mighty mite of a car was built by Nash (which became part of Rambler which became part of American Motors which became part of Chrysler which became part of Daimler Mercedes) in England in the 1950s mostly out of Austin parts. In California, old cars never die (for one thing, there is no road rust). Someone keeps this wonderful specimen running up by the pre-school that my Nicky and Mathew attend. The plate is “MYTE MET”, but I think of it as the “Mighty Mite.” We see it on errands around Berekely sometimes. This morning, we dropped Nicky and Mathew off at school and I hurried back to the car to get Julian to school. The sun was just coming up over the coastal range. Julian and I looked ahead, and there was sunlight pouring throught the windows of the Mighty Mite. We rushed over to snap a few photos while Phyllis finished up with the younger kids. 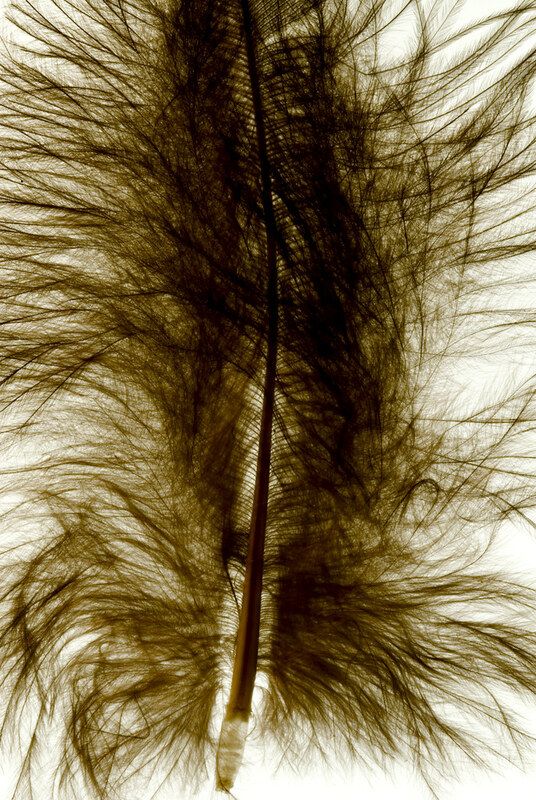 Turkey Feather, photo by Harold Davis. View this photogram larger. 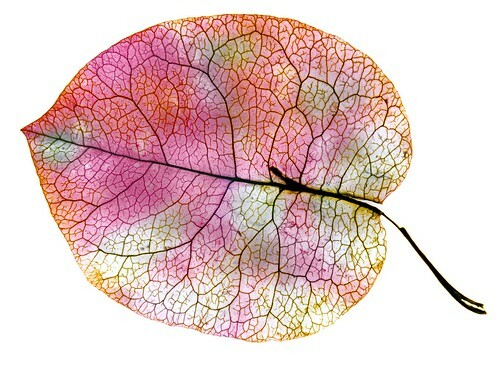 This turkey feather looks to me almost like a strange textile construction! 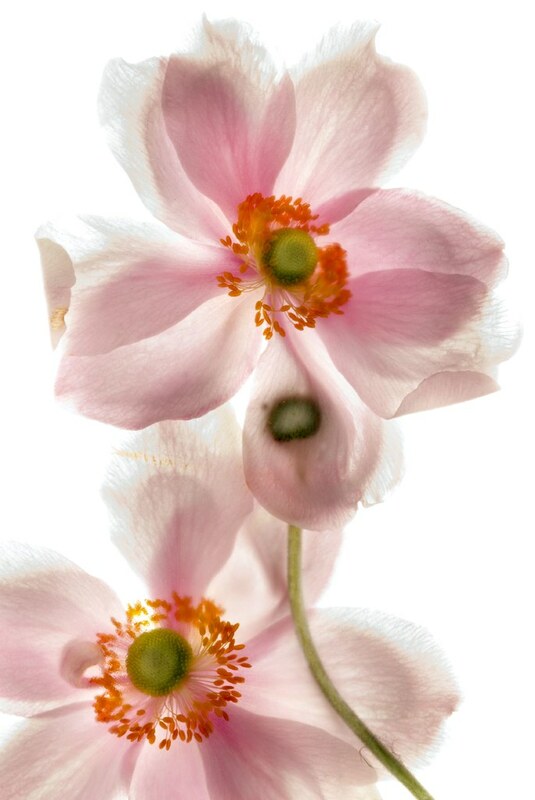 Anemone Japonica 1, photo by Harold Davis. View this photograph larger. This is the first of a series of photos of Japanese Anemomes created using a variant of my digital photogram technique. Nicky and the Chocolate Sandwich, photo by Harold Davis. View this photograph larger. Lightly toast white bread (remove from the toaster before the first discoloration). An oven-style toaster works best, leave it running. Slather the toast with butter. Return to toaster and toast until very lightly golden. Remove from toaster and place on a large paper plate. 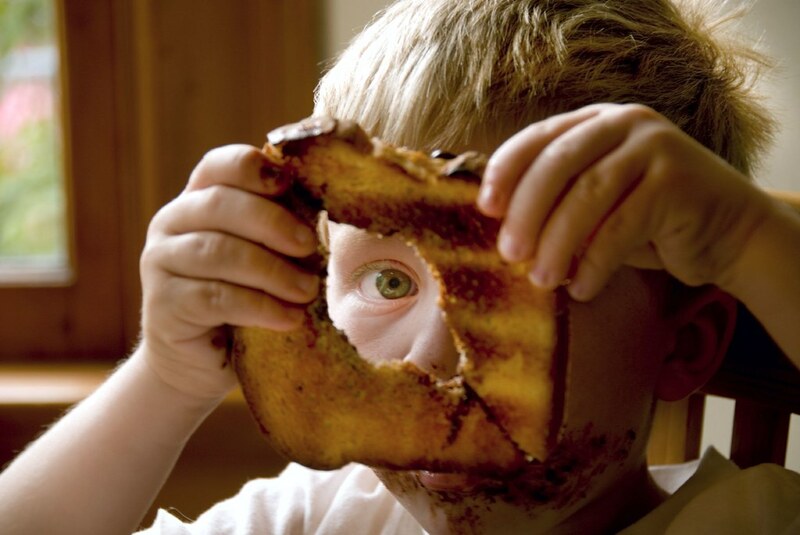 Cover each piece of toast as evenly as possible with chocolate drops. Replace in toaster, toast until chocolate starts to melt. Remove. Place two slices of bread together, chocolate in the middle. Cut sandwich in half (note: handle with care, chocolate sandwich is hot and gooey). Place chocolate sandwich in freezer, and cool to taste. Time: about five minutes, great entertainment value in the process. 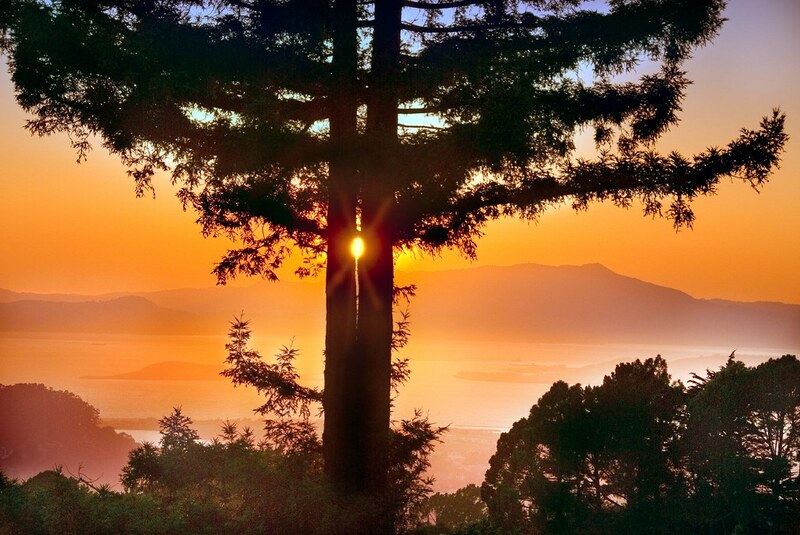 Mount Tamalpais from Euclid Avenue, photo by Harold Davis. View this photograph larger. So, I did. Grabbing a camera, of course. After we’d clambered around for a while on Indian Rock, we decided to go somewhere else. The sun was setting as we parked near one of my favorite view spots on upper Euclid Ave in the Berkeley Hills. I waiting for the setting sun to fit just between the trees, and snapped this photo. 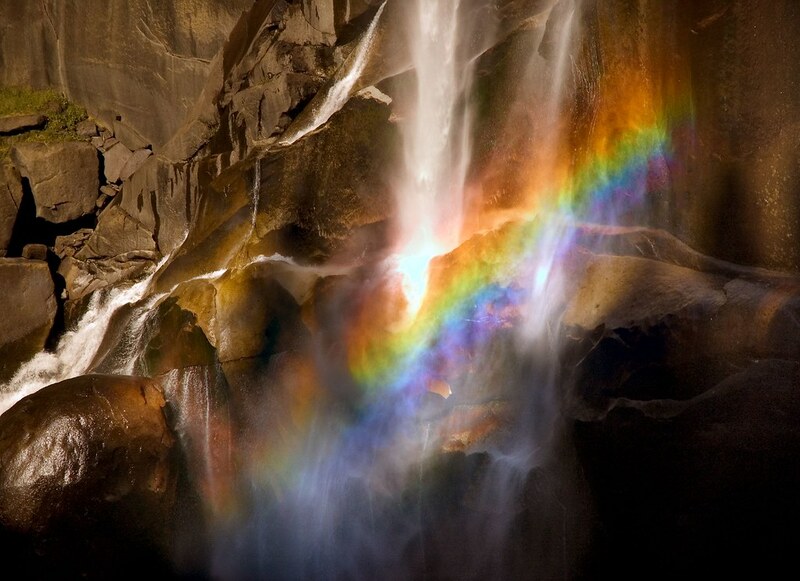 Rainbow in the Mist, photo by Harold Davis. View this photograph larger. I took this photograph in early October several years ago along the Mist Trail which runs beside Vernal Falls in Yosemite Valley. One is pretty sure to see multiple rainbows from the Mist Trail no matter when one climbs it, although Vernal Falls will get you wet in the spring and not in the autumn (here’s a spring photo!). I am in the process of preparing this image for publication. When I looked at my original conversion of the photo, I felt that I’d like to see a bit more of the shadow areas, and also a bit more punch in the rainbow colors. My new post-processing took a bit of fancy footwork. In order to capture more of the shadow detail, I imported four different exposures of the RAW original and combined them using layer masks and the Photoshop Paintbrush Tool. A side note here: I don’t really consider this kind of post-processing High Dynamic Range (HDR) imaging. HDR creates a far great dynamic exposure range than you find in a conventional photo, usually by combining several exposures. I work within one exposure. (You couldn’t really take multiple images that are identical except for exposure of a moving waterfall and rainbow in any case.) 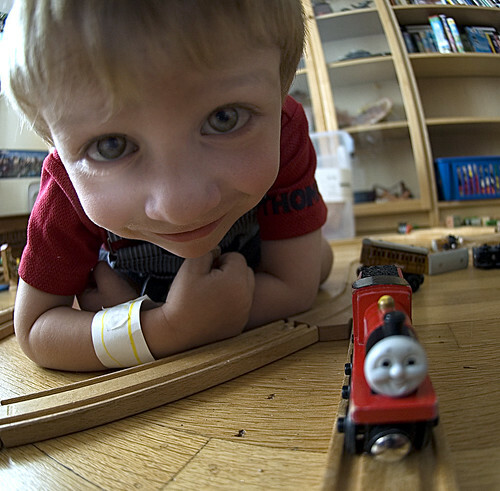 This gives me a 5 or 6 f/stop range or possible exposures, which should be enough. My next challenge was to get more color into the rainbow. Here’s where CHOPs (short for channel operations) come into the story. I converted the image to LAB Color mode. I duplicated the image. Next, on the duplicate image, I adjusted the A channel used Image > Adjustment >Equalize. This creates an extreme color shift in the channel. I then pasted the entire duplicated image onto a new layer in the original image, masking out everything except the rainbow. I cut the opacity of the pasted layer down to 30%, and switched the blend mode fron Normal to Color. I also added a bit of Gaussian blur to the new layer. This doesn’t impact the sharpness of the L (luminosity) channel, and the L channel is the key to managing image sharpness in LAB mode. I repeated this process for the B channel. The rest was just my routine workflow that I use for processing any image. Morals of this story: It’s good to be a CHOP jock. 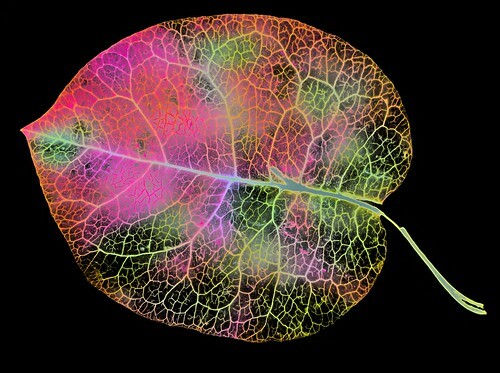 And digital photography takes plenty of digital chops. Frond, photo by Harold Davis. View this photogram larger. 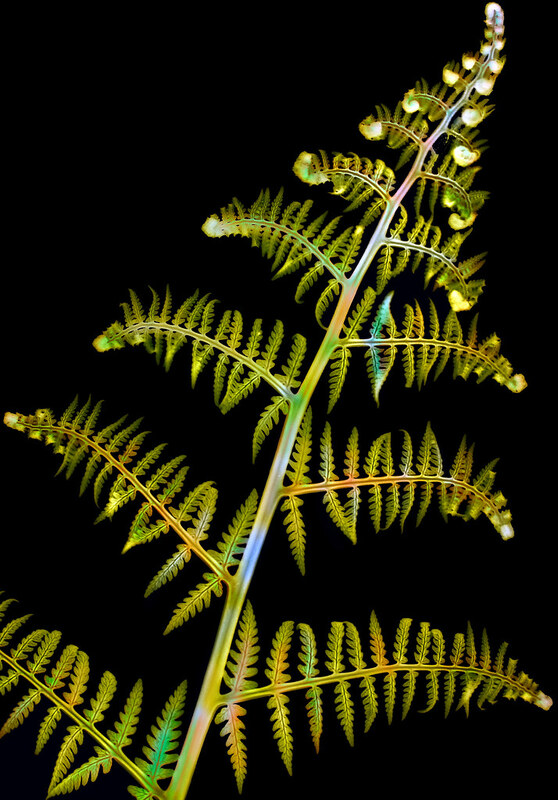 I fondly subjected a fern frond to the digital photogram treatment, with these results. Capillarity I, photo by Harold Davis. View this photogram larger. 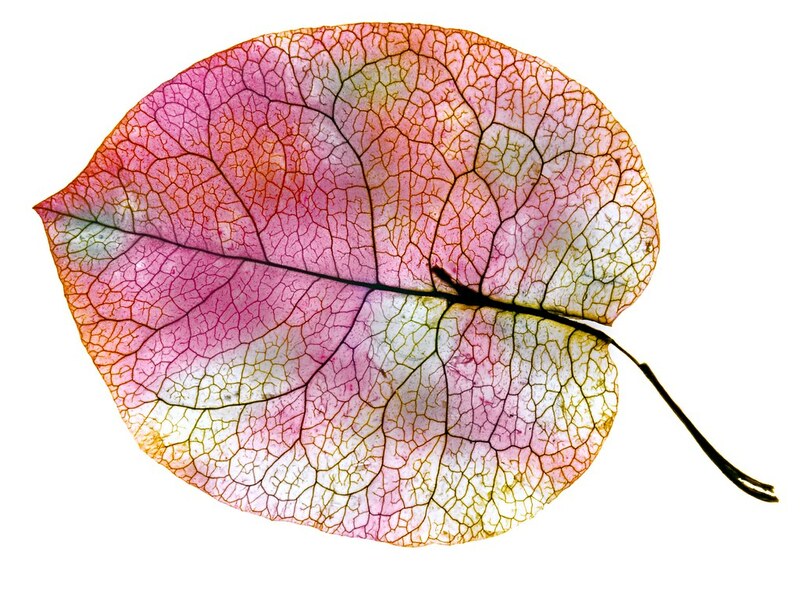 This pair of digital photograms shows capillarity, or capillar action, in a leaf. 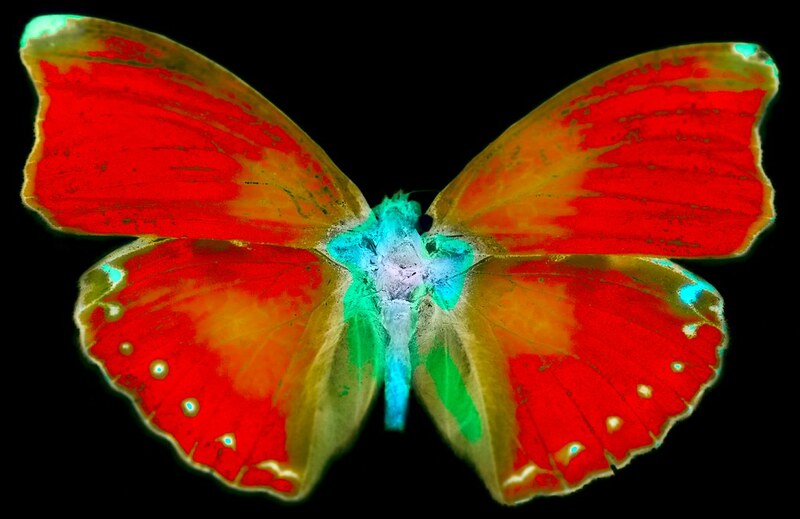 The version above has had the LAB Color channels inverted. The behind-the-scenes tool that makes work like this possible for me is my new Mac Pro with four (count them, four!) Intel Xeon processors, and a thirty inch monitor. The monitor gives me the ability to see my images at close to 100% when I work on them, and the Mac Pro gives me the power I need to drive my image processing. This is the system that every digital photographer should have!